Yesterday, my parents and I went to Jurong West Swimming Complex. It is just across the road from our house. But yesterday, we did not go straight there because we wanted to have lunch at Kofu foodcourt at Pioneer Mall. After having our lunch, we went to the swimming complex. First, we went to the lazy river. My father and I went in first. Later on, my mother joined in. We spent a lot of time there. 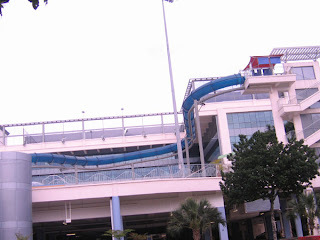 After that, my father and I went to the water-slide. It is 10.2m in height, so we needed to climb 3 storeys high to reach the top of the slide. It was my first time taking a water-slide that high. I was a bit nervous so I wanted to slide together with my father, but the sign said that we were only allowed to slide one at a time. As my father let me slide first, I had to reach the bottom of the slide before he could do his turn. I enjoyed sliding at the water-slide so I wanted to do it over and over again, but the queue was getting longer and longer so I only had 5 turns to go. Then we went to the jacuzzi pool. The water was very warm, but the water sprayed very strongly so I only spent a little time there and played at the kids-fun-pool while waiting for my parents to come out. Later on, we went back to the lazy river. After a while, my parents went out of the lazy river but I kept swimming around. It was very fun. Pinter deh ponakan gw, hehe..